Day 2 of my 3 day refresh cleanse. Day to went surprisingly better than I thought it would. Breakfast was amazing, sticking to my fave Shakeology. Fiber sweep was pretty good to and it finally did it duty! ----You guys! I almost threw in the towel and started snacking on some gluten free snack foods I normally eat as a snack. I didn't want to do the vanilla fresh again. I was going to give in and say "SCREW IT" but then I thought of you guys and also the challengers in my private support group I am in as a challenger and how they have stuck to it (I am a day behind everyone). And decided to try one more time and if I still couldn't do it without gagging then I would stop. I decided to blend up fresh strawberries with it. It wasn't as bad. It was still gross but I got it down to the last little swallow where I threw it back up and just that little bit. I figured out I can't smell it and just drink as many gulps as possible to get it down. I'm gonna stick to it. Plus motivation of our family pictures we are doing this weekend helped. 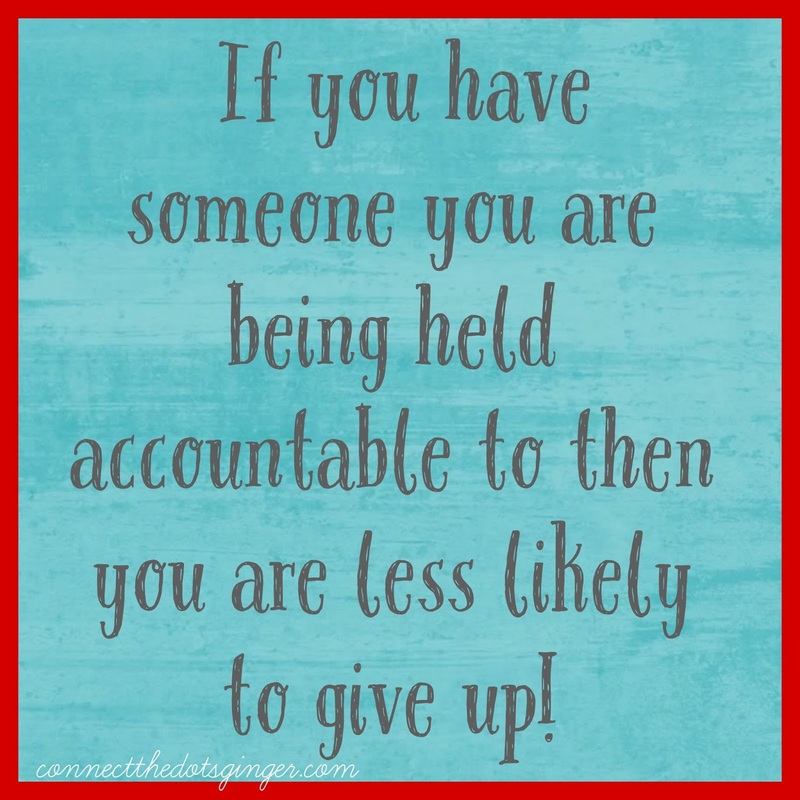 But the number one factor to not snacking and giving up was my fellow support group challengers. IT REALLY DOES WORK YOU GUYS! 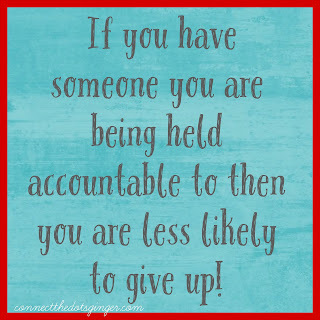 If you have someone you are being held accountable to then you are less likely to give up! But I stuck it out and I got it down. And dinner went surprisingly well too. I was able to drink the whole vanilla fresh and my tomato and cucumber salad was surprisingly filling. I am not hungry at all. I feel great! So tomorrow is the 3rd and final day. A little nervous for it because I am going to be gone all day long. But I am packing all my snacks with me and planning out everything. Tons of water too! I am so excite for tomorrow! See you then! The 3-Day Refresh is a cleansing program that’s simple to use and gets great results. It’s a program of three daily shakes, a fiber drink, recipes that include a delicious and nutritious medley of fresh veggies and fruits, and plenty of healthy fats so you can lose weight without feeling like you’re starving yourself. The 3-Day Refresh has uncomplicated meal plans that are easy to prepare and fun to eat. Meal plans offer many choices from the food groups in the dishes, so there’s no boredom, and if you don’t have one ingredient, it’s easy to substitute another. The 3-Day Refresh is a great way to start a serious weight-loss change, but it’s also great for fitness buffs that have stalled in their progress. The essential cleansing nature of the 3-Day Refresh kickstarts your body’s natural digestive balance to get you feeling more active and energetic while you shed unwanted pounds. You’ll have to start out the day with at least 10 ounces of pure filtered water. Many people find it hard to drink so much water first thing in the day, but that’s a sign of an underlying problem. Almost no one drinks enough water! Your body needs water in order to flush out the toxins that build up in the body. Your body needs water, and once you get used to drinking more water, you’ll notice how much you enjoy it in addition to the health benefits you’ll get. Thirty minutes later, you can have a chocolate Shakeology shake along with a piece of fruit. Shakeology shakes taste great, are packed with energy, and have enough vitamins to allow you to stop taking your multivitamins if you like. 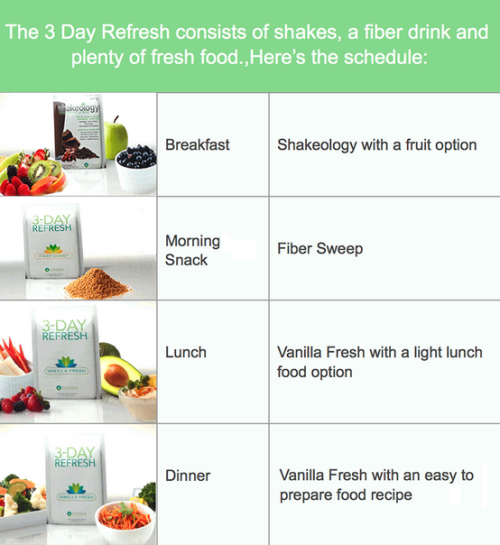 The 3-Day Refresh Meal Plan supplies a health drink called the Fiber Sweep. Fiber Sweep is a blend of fibers, some which dissolve in water, others that are insoluble. It’s jam packed with flax, psyllium fiber, and chia seeds. These deliver important Omega-3 fatty acids to aid digestion while giving you a gentle cleanse. You’ll drink lots more fresh water, too, or green tea if you like. Coffee is OK, too, but no cream and sugar. The 3-Day Refresh Meal Plan lets you choose one fruit, a vegetable, and one food item that contains healthy fat from their extensive lists of suggested foods. Then you have a delicious drink called a Vanilla Fresh. It’s full of protein, important for supplying you with energy for the rest of the afternoon, and it’s jam-packed with probiotics, minerals, and vitamins. It contains a clinically tested potato extract that makes you feel full, but the shake itself is light and creamy. Time for more filtered water. 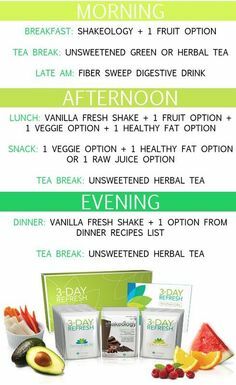 The evening meal is where the 3-Day Refresh Meal Plan really shines. The method has great recipes for tasty meals, like a stir-fry medley of vegetables to go with hearty salads. The recipes are easy to follow, and they have selections to make hot or prepare and store if you prefer. The evening meal included another Vanilla Fresh shake, and then lots more water. Since the actual food intake during the day was so low, it’s uncanny how full you feel, and how much energy you have. If you continue the plan for three days, your cravings for your old food favorites diminish quickly. You’ll be drinking a lot of water and consuming a lot of filling shakes, but you expel them quickly along with all the toxins your body needs to be rid of. It seems crazy, but drinking all that water makes you feel less bloated than you would after a heavy meal. Your body needs water and processes it effortlessly. If you keep track of your progress, you’ll see real, measurable results. Depending on whether you’re starting a serious weight loss plan or tuning up an existing fitness routine, you’ll lose inches and pounds on your belly, upper arms, and upper legs. Give the 3-Day Refresh Meal Plan a try, and feel better and look better right away!